God’s assignment for Joshua might have caused him some concern. Being the successor to Moses was no small task. Through Moses, God had turned the waters in Egypt into blood, parted the Red Sea, destroyed the Egyptian army, and miraculously fed the nation for forty years. God spoke to Moses on Mount Sinai and gave him His law. Joshua must have wondered how he could follow Moses. To erase any doubt, God assured Joshua that Moses’ accomplishments had all been due to God’s presence. Joshua grew confident because the same God who walked with Moses now walked with him (Josh. l:6). 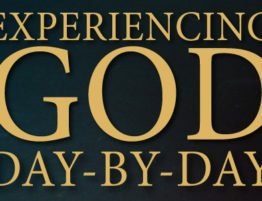 As you read the accounts of God’s miraculous work through men and women in the Bible, you may wonder if God still performs such miracles today. Be assured that the same God who walked with Moses, Joshua, Elijah, Peter, James, John, and Paul now lives within you. No power can defeat the God who guides you. The God who blessed them is just as capable of working out His purposes through your life. The same God who gave them victory over seemingly invincible enemies, who provided for them when their own resources were insufficient, and who guided them in their decisions, is prepared to work as powerfully in your life today. The heroes of the faith had one thing in common: They were all ordinary people with no power of their own. The difference is the mighty presence of God. Times may change, but the effect of God’s presence remains the same.